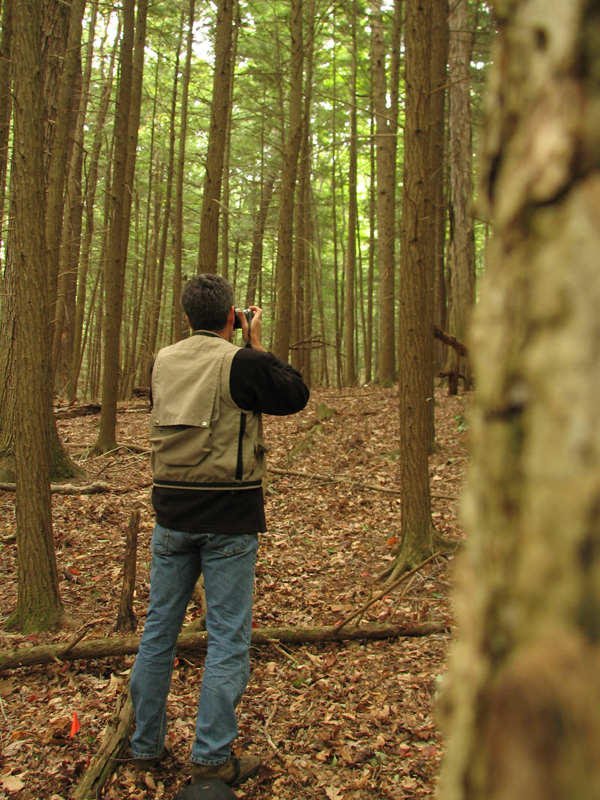 My research focuses on North American forests, especially in the eastern United States. As a biogeographer, I am interested in the patterns that emerge from the interactions of the physical environment, biotic processes, and disturbance. Incorporating field work, spatial modeling, and geographic information science techniques, I am especially concerned with the role of humans in altering “natural” templates, and the implications for such change on biotic communities. Below I describe in more detail my recent research projects, and information on courses I teach. Feel free to contact me if you have any questions, or if you have an interest in our graduate program at Ohio University. Water Balance Toolbox for ArcGIS and User Manual FULLY-AUTOMATED VERSION 3 NOW AVAILABLE (You may need to refresh your browser). from Dyer, J.M. 2009. Assessing topographic patterns in moisture use and stress using a water balance approach, Landscape Ecology 24: 391-403.
from Dyer, J.M. 2006. Revisiting the Deciduous Forests of Eastern North America. BioScience 56: 341-352. My recent research interests have focused on predicting vegetation-site relationships, using a water balance approach. Such an understanding is critical for assessing the effects of future climate change, or to evaluate changes related to historic land use patterns. Since plants respond to moisture supply and demand across all geographic scales, the water balance can serve as an effective predictor of continental range limits, or species occurrence within individual forest plots. I also have been actively exploring changes in forest composition and structure in southeastern Ohio since settlement, most recently as part of an NSF-funded Appalachian Ohio Forest Research Group. I have used witness tree records to construct “baseline” vegetation patterns, then drew upon archival land use records, historic air photos, and field sampling to examining the role of historic land use in shaping the present-day flora of central Appalachian forests. Although southeastern Ohio is heavily forested today, land use practices have left distinctive “signatures” on these communities. Currently I am involved in a study to monitor changes to Ohio’s hemlock forests, before the arrival of the invasive Hemlock Woolly Adelgid (HWA). HWA has resulted in high mortality in hemlock stands that it has infested in the eastern U.S., and its expansion into Ohio is likely to have devastating ecological and economic effects. 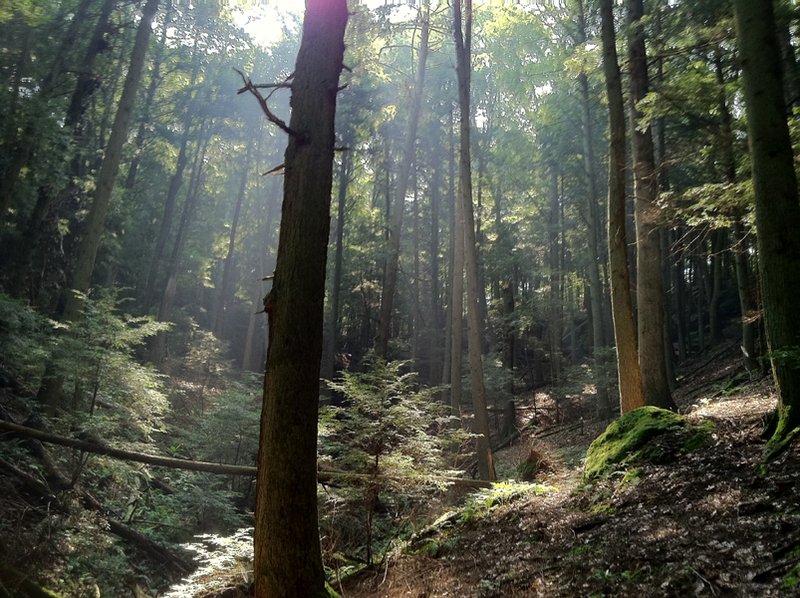 In Ohio, hemlock forests occur in the eastern half of the state, and are often associated with steep slopes and ravines. Hemlock is a long-lived, shade-tolerant tree, and is often a dominant species in terms of its abundance and influence; this “foundation species” creates a unique microenvironment and provides habitat for animal species not typically associated with surrounding hardwood forests. 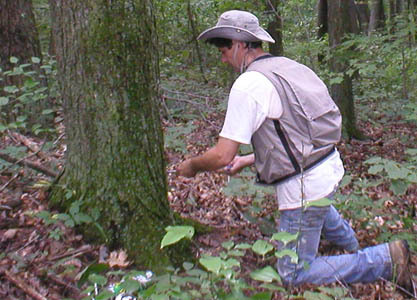 My students and I have been collecting data on hemlock forests in southeastern Ohio since 2007. After establishing permanent plots, we have collected compositional data on the trees and herbs, tree-ring cores, and photographs. Since hemlock stands have distinctive light, temperature, and soil-nutrient conditions, we are also collecting soil samples and have installed microclimate data loggers. Ecologically, it is crucial that we establish baseline conditions of these unique forests before they are irrevocably altered by the introduction of HWA. Despite the sobering thought of the altered environmental conditions that will result with the loss of this keystone species, this study has provided an excellent opportunity to engage Ohio University students in applied environmental projects. Feel free to contact me if you are interested in pursuing this research as a thesis topic, or if you are familiar with the herbaceous flora and would like to get involved with vegetation sampling. Hemlocks maintain their dense canopy of foliage year-round. 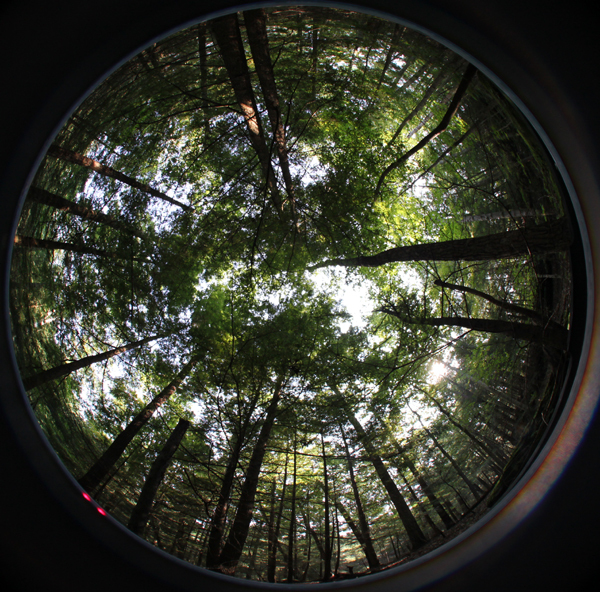 Hemispheric photos enable us to track changing light conditions following the loss of hemlocks. Dyer, J.M., and T.F. Hutchinson. 2018. Topography and soils-based mapping reveals fine-scale compositional shifts over two centuries within a central Appalachian landscape. Forest Ecology and Management, https://doi.org/10.1016/j.foreco.2018.10.052. Pederson, N., A.W. D'Amato, J.M. Dyer, D.R. Foster, D. Goldblum, J.L. Hart, A.E. Hessl, L.R. Iverson, S.T. Jackson, D. Mario-Benito, B.C. McCarthy, R.W. McEwan, D.L. Mladenoff, A.J. Parker, B. Shuman, and J.W. Williams. 2015. Climate remains an important driver of post-European vegetation change in the eastern United States. Global Change Biology, 21(6): 2105-2110. Pederson, N., J.M. Dyer, R. McEwan, A. Hessl, C. Mock, D. Orwig, H. Rieder, and B. Cook. 2014. The legacy of episodic climatic events in shaping temperate, broadleaf forests. Ecological Monographs 84(4): 599-620. Anning, A., J.M. Dyer, and B.C. McCarthy. 2014. Tree growth response to fuel reduction treatments along a topographic moisture gradient in mixed-oak forests, Ohio, USA, Canadian Journal of Forest Research 44(5): 413-421. McEwan, R.W., J.M. Dyer, and N. Pederson. 2011. Multiple interacting ecosystem drivers: toward an encompassing hypothesis of oak forest dynamics across eastern North America. Ecography 34: 244-256. Dyer, J.M. 2010. Land use legacies in a central Appalachian forest: Differential response of trees and herbs to historic agricultural practices. Applied Vegetation Science 13: 195-206. Dyer, J.M., and C.M. Cowell, 2008. Invasive Species and the Resiliency of a Riparian Environment. Pages 87-103 in R.K. Kohli and S. Jose (eds.) Invasive Plants and Forest Ecosystems. CRC Press, Boca Raton, FL. Dyer, J.M. 2004. A water budget approach to predicting tree species growth and abundance, utilizing paleoclimatology sources. Climate Research 28: 1-10. Dyer, J.M. 2002. A comparison of moisture scalars and water budget methods to assess vegetation-site relationships. Physical Geography 23: 245-258. Cowell, C.M., and J.M. 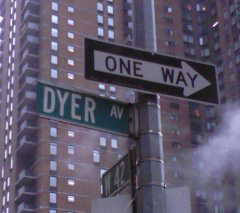 Dyer. 2002. Vegetation development in a modified riparian environment: Human imprints on an Allegheny River Wilderness. Annals of the Association of American Geographers 92: 189-202. Dyer, J.M. 2001. Using witness trees to assess forest change in southeastern Ohio. Canadian Journal of Forest Research, 31: 1708-1718. Dyer, J.M., and K.E. Moffett. 1999. Meadow invasion from high-elevation spruce-fir forest in south-central New Mexico. The Southwestern Naturalist 44: 445-457. Dyer, J.M., and P.R. Baird. 1997. Remnant forest stands at a prairie ecotone site: presettlement history and comparison with other maple-basswood stands. Physical Geography 18: 146-159. Dyer, J.M., and P.R. Baird. 1997. Wind disturbance in remnant forest stands along the prairie-forest ecotone, Minnesota, U.S.A. Plant Ecology 129: 121-137. Pitelka, L.F., and The Plant Migration Workshop Group. 1997. Plant migration and climate change. American Scientist 85: 464-473. Dyer, J.M. 1996. Considerations of scale and ecological processes in a forest migration model: a reply to Roth. Professional Geographer 48: 86-88. Dyer, J.M. 1995. Assessment of climatic warming using a model of forest species migration. Ecological Modelling 79: 199-219. Dyer, J.M. 1994. Implications of habitat fragmentation on climate change-induced forest migration. Professional Geographer 46: 449-459. Dyer, J.M. 1994. Land use pattern, forest migration, and global warming. Landscape and Urban Planning 29: 77-83. Dyer, J.M., and G.A. Brook. 1991. Spatial and temporal variations in temperate forest soil carbon dioxide during the non-growing season. Earth Surface Processes and Landforms 16: 411-426. Ecological Considerations for Risk Management of the Hemlock Woolly Adelgid in the Hocking Hills, Ohio USA, Nicole Stump, MSc 2008 (Albert-Ludwigs University). Download: zipped shapefile or jpeg of hemlock distribution in Ohio, methods and results of GIS mapping from thesis (PDF), PDF of 2009 HWA Summit presentation. Exotic Plant Colonization of the Forest Adjacent to Transmission Line Corridors in Athens County, Ohio, Kaabe Shaw, Environmental Studies MS 2002. Linking Spatial Data with Population Viability Analysis: Reserve Network Design in the Northeastern Ecuadorian Amazon, Galo Zapato-Rios, Environmental Studies MS 2001. Land Use Land Cover Change From 1915 to 1999 in The Gwynns Falls Watershed, Baltimore County, Maryland: Creation of a Suburban Social Ecology, Michael Wehling, Geography MA 2001. Click here to view a summary with figures. The Biogeography of Gapper's Red-backed Vole (Clethrionomys gapperi): A Comparison of Genetic and Morphological Variation in Eastern North America, Emily Whitfield, Environmental Studies MS 1998. Landscape Suitability: A Case Study of Wolf Habitat in North Dakota, Evan Moffett, Geography MA 1997. Catastrophic Windthrow: A Case Study of the Allegheny River Wilderness Islands, Lisa DeChano, Geography MA 1997. A Spatial Analysis of an Urban Fishery: A Case Study of Winnipeg, Manitoba, Ian Kitch, Geography MS 1994.